“Oh god! They are NOT pretty!” Han repeatedly saying no while shaking his head constantly. This conversation happened in Masse, our regular friends meetup bar in Shanghai shortly after we came back from our first Thailand trip. 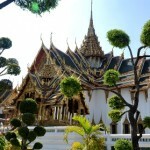 It did remind me that ladyboy is one of the most famous attractions in Thailand. 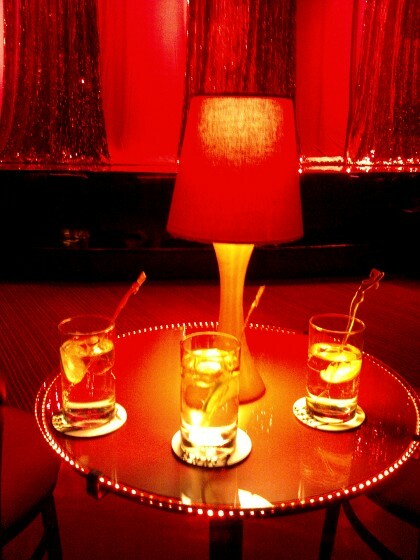 That night, I told Han that it would be interesting to go see a ladyboy show if we got a chance. Here’s our chance! Since my mom’s coming with us to Bangkok this time, it would be even more fun to go see a ladyboy show together. Where can we watch such a show in Bangkok? I did some research and found out about Calypso Cabaret Show. (Click the image on the right to visit their official site.) One thing I liked about this show before it even started was the location! 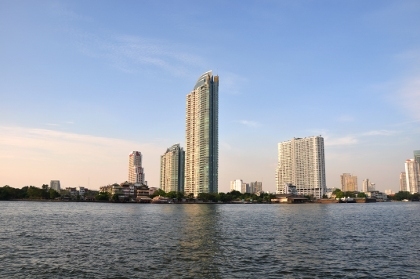 The theatre is situated in ASIATIQUE The Riverfront, a lifestyle shopping area on the bank of Chao Phraya River. They offer free shuttle boat to Asiatique from Sathorn (Taksin) pier, which is fantastic from our 1st day’s transportation perspective since we can just easily hop up on the shuttle boat after returning from the Grand Palace. Tickets booked! Opening from 5 pm to midnight is a feature to define ASIATIQUE The Riverfront as a night market. However, different from a usual night market, it actually is the first also the biggest lifestyle retail project in Asia. 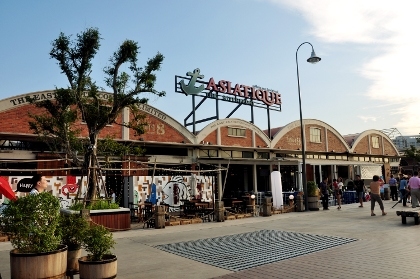 Composed with 10 warehouse style one or two-story buildings, Asiatique is a very nice shopping (including window shopping), dining and entertaining area. Lying on the bank of the river creates a great view and relaxing atmosphere. With BTS and shuttle boat, it’s very convenient to go to Asiatique. Take the BTS Skytrain Silom Line to Saphan Taksin Station where the pier is and switch to their free shuttle boat. That’s it. If you are going there by car or bus, you may refer to their official website about the itineraries. 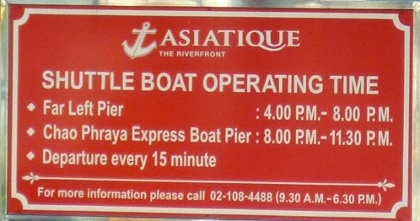 We took the first shuttle boat at 4 pm to Asiatique after visiting the Grand Palace. It was still a little early when we got there since most of the shops were not open yet. Other than wandering around in the area and deciding which restaurant to go for dinner before watching the show at 8:15 pm, getting a Thai massage seemed to be the perfect activity in between. 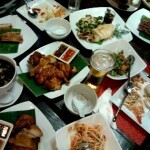 There are more than 30 restaurants in the area serving Thai, Chinese, Japanese, Italian cuisine and seafood. Most of the franchise restaurants and the food circus are gathered in Warehouse 6. 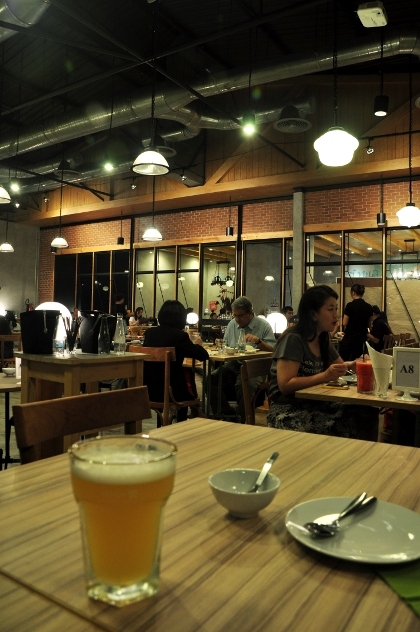 Bar and restaurants are spread out in other warehouses. 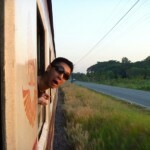 As time was not an issue to us, we walked through each warehouse trying to find a restaurant we had good feeling about. Because it’s going to be my mom’s first official meal in Thailand, we wanted it to be legit! We nailed our choice down to Thai food. 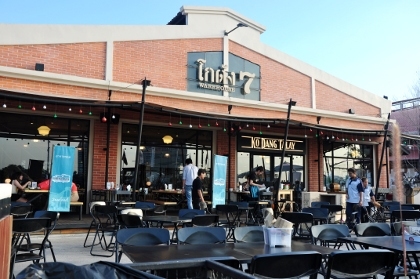 As we passed by Warehouse 7, KoDang Talay with nice outdoor seating area caught our eyes. Walked over to check out their menu. All right, large scale of exotic seafood and it’s Thai. Looked great and turned out it was GREAT! 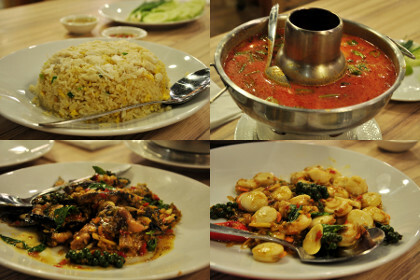 Stuff we ordered – fired rice with crab meat, tomyum soup with milk, basil spicy fish and scallops. The food was very very tasty. Also be prepare for the spiciness if you are not used to spicy food. We loved it! Total cost was 1700 baht. A little pricey but was worth it for the nice environment, service, music and of course the delicious food! I booked the tickets in advance from Canary Travel because they offer 25% off with free drinks which is 900 baht/ticket compare to the 1200 baht walk in price. Show time is 8:15 pm and 9:45 daily. The show lasts for 1 hour and 10 minutes. After the filling dinner, we went to exchange our tickets with the printed email voucher Canary Travel sent to me at the theatre ticket booth. Guess what? We were arranged at the first row close to the stage. Awesome! Sipping free Gin and Tonics. They offer non-alcohol free drinks like coffee or tea too. You are not going to believe the rest of the story but sadly it’s true! 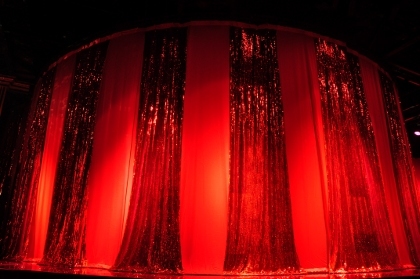 The above photo was taken when the actors and actresses elegantly performed their ending pose of the third or maybe the fourth performance. The show had been on for only about 15 minutes at that time. The actors and actresses went back to the back stage. We were quietly waiting for them to come back to the front with different costumes for the next performance. The stage was darker than it’s supposed to be but we didn’t notice the difference since everyone was eagerly expecting to see more. Nothing happened. They didn’t come back. Even no music. We realized that something was wrong. People started whispering. And then we heard this middle-aged man talking through a microphone in a very apologizing tone. “WTF! Are you serious? It can’t be happening!” I talked to no one in particular. I wish I was kidding! Unfortunately, it WAS happening – a power outage in the middle of the ladyboy show at 2012 Christmas! The middle-aged man who seemed to be in charge went back and forth telling us how sorry he was and the situation was completely out of his control. He explained that this had never happened before. 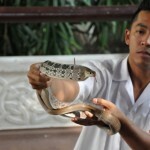 Finally, he regretted to ask audience to get a refund at the ticket booth or from the travel agents. If there is one person remembers the day December 25th, 2012 better than us, it gotta be the manager of the theatre! “Are we lucky or not?” I ironically asked when we walked out of the theatre, also feeling bad because mom didn’t get to watch the entire show. “I think it’s not that bad!” My mom replied, “You see, we watched part of the show, we saw some nice ladyboys very closely, drank three of their Gin and Tonics and we can get all of our money back. Not a bad deal, isn’t it?” She’s awesome! Of course I got a full refund from Canary Travel and the communication was very smooth. 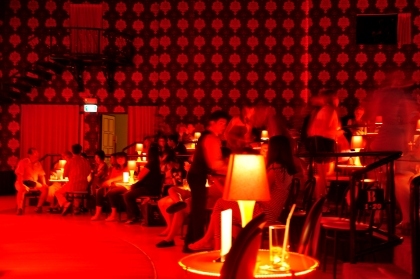 That’s why I can’t really tell you how the Calypso Cabaret Show is. What can I say? Nothing is impossible!!! Many stores in Asiatique had their backup power on. Business was still on going. They seemed to be well prepared for this kind of situation. Customers were still chilling and enjoying the riverfront. There was obviously no boat and it’s hard to get a taxi. 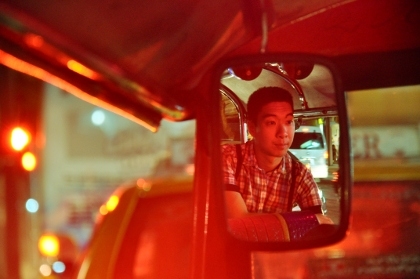 We ended up taking a tuk tuk back to our hotel. Asking price was 100 baht. Deal was done at 60 baht. That’s our first day in Bangkok with mom. The second day was a lot more chill than planned but it was interesting… Stayed tuned, my friend! There is more to come! Awesome! Like your mother said, you saw some part of the show, drank free drinks and had a good dinner on top :) Pretty successful, I think ! Glad you found it helpful! Thank you for stopping by!